High school team rider Ezra Twieten (far left) of the Gear Grinders joins the other medalists on the winners’ platform. 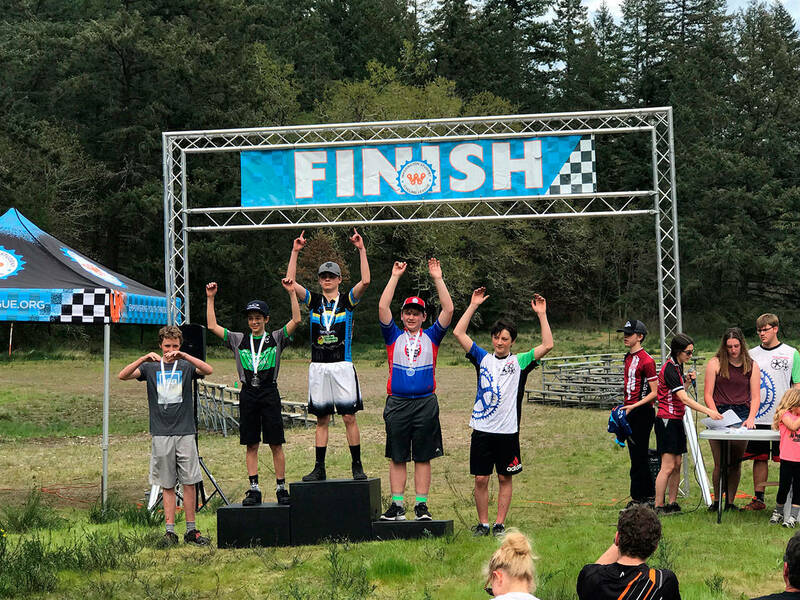 TACOMA – The Bainbridge Island composite mountain bike team, the Gear Grinders, had several impressive showings at their second race of the season, which took place on May 6 amidst a competitive field of Washington Student Cycling League teams from across the state. Twenty-five high school and 26 middle school teams raced on the hilly trails in the woods of Joint Base Lewis-McChord. The 4.7-mile track, which requires multiple laps for most race categories, included two 8 percent climbs, twisty single-track trails in the forest and a few wide-track areas for passing. The Gear Grinders high school team’s series overall ranking is currently fifth out of 25, team officials said, and the middle school team’s series overall ranking is ninth out of 26. “It was a great second outing for the team this season,” said Co-Head Coach Matt Albee. “Our program has developed year after year, to the point where we have riders competing for top spots in many categories. Both middle school and high school teams placed in the top 10 in the team points competition, out of 25-plus, where they have consistently finished over the past two seasons and three riders finished on the podium in their individual categories at this race. “It’s fantastic to see so many kids racing their hearts out on weekends and enjoying mountain biking on the trails on and around Bainbridge Island during our practice rides,” he added. The next WSCL race in the four-race series will be in Roslyn on Sunday, May 20. In Tacoma, high school rider Ezra Tweiten scored points for the team and was on the winners’ stand after winning a fourth-place medal for Beginner Boys. He is in second place overall in his race category. Also scoring points for the high school team were: Olivia Cavalluzzi and Aiyana North (fourth and seventh series overall, respectively, for Intermediate Girls ); Cole Albee (fourth in series overall for Intermediate Boys); and Duncan Rutherford (fifth overall for Beginner Boys race series). High school team members scoring individual points were: Abe Muldrow (JV Boys); Aiyana North, Olivia Cavalluzzi, Erin Thackray, Ashlynn Brady (Intermediate Girls); Cole Albee, Colin Lindquist, Mickie Wilkinson, Nolan Joslin, Will Robertson, Edgar Flynn, Aidan Brady, Connor LaCroix, Martin Vroom (Intermediate Boys); Ezra Tweiten, Duncan Rutherford, Kellen Hungerford, and Tyler Pickett (Beginner Boys). The middle school team’s Will Siebert and T.J. North both scored points for the team and made it to the medalist platform: fifth place for Siebert in Advanced Middle School Boys and fifth place for North in Eighth Grade Boys. Both North and Siebert are in third place for their categories in the series overall. Also scoring points for the team: Jackson Stoehr (seventh in series overall Advanced MS Boys) and Milo McIntosh (10th overall Advanced MS Boys), Lu Apel (fourth place in Sixth Grade Girls overall), and Xin Munson (eighth place in Sixth Grade Girls overall). Intrepid team members who scored individual points were: Adam Barsotti, Ben Stone, Quentin Ikuse, Henry First, Max Morse, Koen Friszshe, Jasper Witten Carr, Cameron Cole, Payton McPhail, Gabe Phillips and Ian Brock. “It’s humbling to see how hard these kids work,” said Co-Head Coach Kelly Muldrow. “Race day is their payoff for long months of training in cold and rain and mud. Frankly, I’m blown away by how hard they work. Every Gear Grinder that lines up to race finds a way to cope with butterflies at the starting line and mud and roots and rocks and hills and spills on the way to the finish line. “Every kid who races is a celebration of grit and determination. It’s never easy, but they really seem to love it,” Muldrow said. Middle school team rider TJ North (far right) of the Gear Grinders celebrates his medal at the finish line.